This interview was conducted using electronic mail. Questions composed by the Hammer's new media manager Amanda Law. 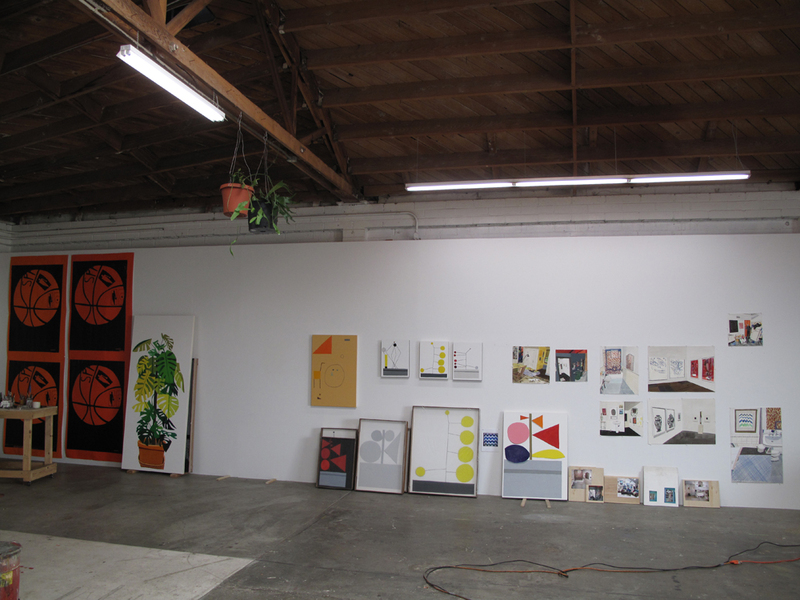 Look for information on Jonas Wood's Hammer Project here. AL: I see from your bio that you went to undergrad for psychology but then received an MFA in painting and drawing. How did you travel from one subject to the other? JW: I chose to go to a liberal arts school so that I could pursue both science and art classes. I finished my psychology major after junior year and senior year I focused mainly on learning how to paint. AL: There are a lot of plants in the Hammer exhibition. Why plants? JW: I first started painting plants after grad school as a means to paint from life. When I moved to LA I was really taken with the plant life (succulents mostly) and started painting plants more and more. AL: Can you tell me a little bit about your art-making process? JW: I make paintings from drawings. I make collages and make paintings and drawings from them. Making studies gives me a blue print for how I want to make a painting. With these new plants, most were made from drawings. I made hundreds of drawings of these new plants. In those drawings I was working out the kinks and trying to locate what felt right. I made some paintings of these new plants that were terrible. I cut them up and glued pieces to new canvases and made new configurations. Then I made paintings of these collages. The new plant with the shadow was painted from life from a collage. AL: Why painting? I know that you do collage and photography, but do you show that work? Is it connected to your painting? JW: I have shown drawings that are collaged but I have never shown any of my photo collages. For me most of my work is based on trying to make a painting. Drawings exist as drawings and collages as collages by themselves, and they can be shown outside of painting, but I have a painting practice. Most things I make are a means to try to get to a painting. I went to a very traditional painting grad school at the university of Washington. How does drawing inform painting and vice versa? That was something that I really held onto. JW: Why not. I see where I can pursue it and at some point I am sure I will. JW: Color is something that I am really into. I guess everyone is into color in some way. Color is a balancing act. I see these new plant paintings as just an exercise in shape and color balance. Using local color is just a tool like perspective. You can see it and maybe you can use it to your advantage in some way, but it actually is pretty boring. When color challenges you, and tells you a plant is blue not green, then maybe color can ask you new questions about what you are seeing. AL: What would you like to be asked? JW: These were good questions. I feel full.